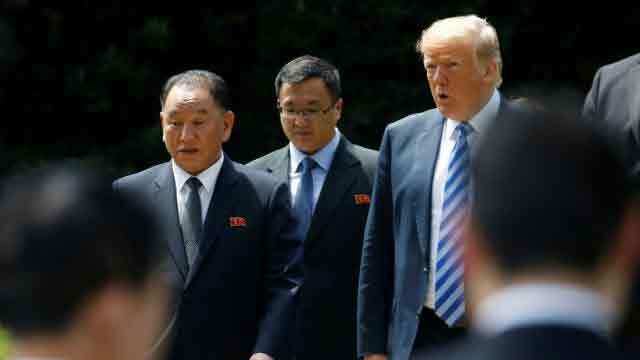 Washington, Jun 2 (Just News): US president Donald Trump said Friday he will meet North Korea’s Kim Jong Un as originally scheduled on 12 June for a historic summit after extraordinary Oval Office talks with a top envoy from Pyongyang. Speaking after more than an hour of talks with Kim Yong Chol in the Oval Office, Trump told reporters that denuclearisation-and a formal end to the decades-old Korean war-would be on the table in Singapore. But the US leader warned that he did not expect to immediately sign a deal to bring a halt to the North’s nuclear program. “I never said it goes in one meeting. I think it’s going to be a process, but the relationships are building and that’s very positive,” he said, after waving farewell to the North Korean envoy, Kim’s right-hand man. Kim says he is committed to “denuclearisation” in some form, but he is expected to demand security guarantees-one of which could be a formal end to the conflict with the US and South Korea. Kim Yong Chol, the most senior North Korean to visit the United States in 18 years, spent almost 90 minutes in the Oval Office. Afterwards, Trump and US Secretary of State Mike Pompeo walked the North’s small delegation to their waiting cars, smiling and shaking hands in front of the media before the motorcade pulled away. North Korean officials said Kim Yong Chol was expected to return to Pyongyang shortly. Meanwhile, discussions between US and North Korean officials continue in Singapore and in the Demilitarised Zone between North and South Korea. On Thursday, Kim Jong Un told Russia’s foreign minister Sergei Lavrov that his commitment to denuclearisation remains “unchanged and consistent and fixed,” but experts warn he will seek concessions from Washington. In addition to an end to the war, he is likely to seek international recognition as well as guarantees against any strike by the US forces stationed in South Korea. As expected, Kim Yong Chol handed Trump a letter from Kim that may clear up some of the questions. The US leader said the missive was “very nice”-but then admitted he had not yet read it. An aide later confirmed he did after the talks. The Oval Office talks and letter delivery came only a week after Trump threatened to consign the entire process to history, abruptly cancelling the summit in a sharply worded letter, only to revive preparations shortly afterwards. Since the short-lived boycott threat, diplomats from both countries have conducted an intense flurry of talks, culminating this week when Pompeo sat down in New York with Kim’s envoy. Pompeo said on Thursday that, after what have now been two meetings with Kim Jong Un and three with Kim Yong Chol, he believes the North is at least ready to consider addressing US demands for denuclearisation. The flurry of diplomacy has also seen a rapprochement on the Korean peninsula, with the two Koreas holding high-level talks Friday at the border truce village of Panmunjom. The meeting followed two landmark summits between the leaders of North and South Korea in the last five weeks. North and South Korea agreed to hold more meetings throughout this month to carry out the agreements reached between their leaders at the April summit, according to a joint statement issued after Friday’s talks. Seoul welcomed Trump’s meeting with Kim Yong Chol at the White House. “The delivery of a letter from chairman Kim Jong Un to president Trump has apparently broadened and consolidated the road to the North Korea-US summit,” said Kim Eui-gyeom, spokesman for South Korea’s presidential Blue House.